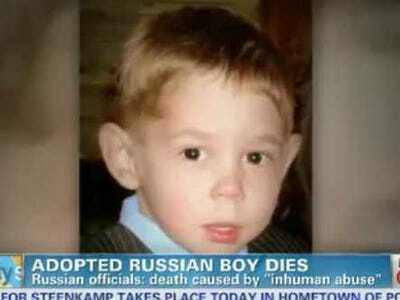 The US ambassador to Moscow called on Russia to stop “sensational exploitation” of the tragic death in Texas of an adopted Russian boy as parliament Friday issued a special appeal to the US Congress on the escalating scandal.The January death of three-year-old Maxim Kuzmin was this week alleged by some Russian officials to be murder by his mother Laura Shatto, whipping up a storm of controversy less than two months after Russia banned US adoptions. In an emotional blog post dated late Thursday, US ambassador to Russia Michael McFaul said he was troubled by how the American people, legal system and diplomacy are being portrayed in the Russian press. “I am troubled by how my people and my country are being portrayed by some in the Russian press,” he wrote hours after a federal television channel aired a prime-time talk show where speakers alleged that Americans subject children to religious cults and torture. “It is time for sensational exploitations of human tragedy to end and for professional work between our two countries to grow, on this issue and many others,” he added. “Just as it troubles me to see unfair stereotypes of Russians and Russia in the American press, it pains me to read these inaccurate portrayals of Americans and our values by some in your media,” McFaul wrote. In the talk show, Yulia Kuzmina, the mother of Maxim Kuzmin and his younger brother Kirill, who remains in the custody of the Shatto family, told the audience that “she is afraid the same will happen with Kirill” and would now like her surviving son back. Other speakers on the show exclaimed that Kuzmina’s children were stolen and discussed American totalitarian sects who force-feed children drugs. But despite her assurances of sobering up enough to resume custody of adopted Kirill, Kuzmina got drunk on the way home from her Moscow TV appearance and was kicked off the night train for causing a disturbance, tabloid Komsomolskaya Pravda reported. Although the paper provided scans of the police report regarding Kuzmina’s overnight adventure on her way to Pskov in western Russia, she told RIA Novosti agency that the reports are not true. “We got to Pskov just fine,” she said. The Kremlin’s children’s rights envoy Pavel Astakhov, who was the first to allege that Maxim Kuzmin was murdered, on Friday said that his birth mother “evokes pity” and deserves to have a court decide if she is fit to be a parent. State Duma deputies meanwhile approved a special appeal to the US Congress asking American lawmakers to assist Russia in returning Kirill to his home country, take measures to ensure safety of other adopted Russian children, and provide information about all US families with Russian adoptees. “Kirill Kuzmin’s continued residing with the family where his older brother has been murdered is unacceptable,” said the appeal to Congress which was overwhelmingly approved by Duma deputies. Lawmakers blamed US authorities for failing to prosecute US parents who harm Russian adoptees, justifying the recent adoption ban. “The situation proves that we were right in taking the decision to ban the (US) adoption of children into this country,” senior lawmaker with the majority United Russia party Sergei Neverov said ahead of the vote. Authorities in the US State of Texas have said that Maxim Kuzmin’s body had bruises, but that a more comprehensive report is needed to establish whether they led to his death. The US State Department this week cautioned against jumping to conclusions and directing murder allegations at the Shattos before a full report is released.